Chopper 5 over damage caused by a tornado in Van, Texas, May 10, 2015. Texas Education Agency Commissioner Michael Williams issued a statement Wednesday saying the Van Independent School District had been granted an attendance wavier that will allow them to cancel classes for the remainder of the year for Pre-K through 3rd grade students. 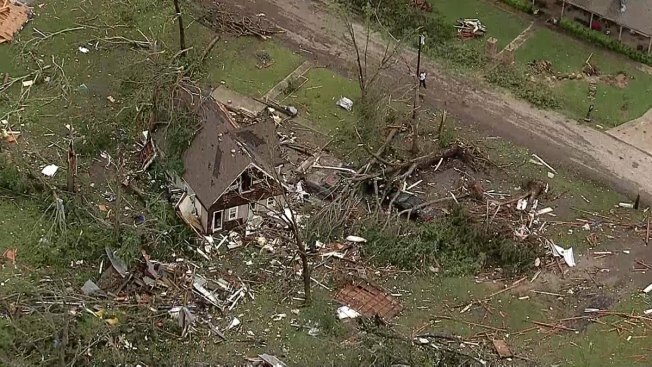 The district's elementary school suffered extensive damage when an EF-3 tornado with winds speeds as high as 140 mph ripped through the small East Texas town. All five of the district's campuses suffered damage in the storm. Two people were killed and more than three dozen were injured as the storm pushed through Van Vandt County Sunday night. Gov. Greg Abbott has issued a disaster declaration for the county, clearing the way for additional government assistance.